Embark on an epic journey back to the Cretaceous Period in the latest Play'n GO slot filled with discoveries and suspense along with free spins, respins, and more. More than 66 million years ago, during the Cretaceous Period, dinosaurs ruled the vast plains of the earth that are now known as North America. Unfortunately, it ended quite abruptly due to an extinction event that was caused by an enormous meteor strike, wiping out more than three-quarters of the planet. Although no one actually knows what it looked like, Play'n GO decided to recreate this dangerous era in their image with their latest slot called Raging Rex. The new Raging Rex slot developed by Play'n GO casino software places you in a tropical forest with giant plants and trees from this era along with a waterfall thundering down a hill located in the background. The 6x4 reel structure is complemented with 4,069 Ways to Win and provides a maximum payout of 5,000 times your total bet. Players will also be impressed with the wide range of slot features, including Rampage re-spins, Raging spins, scatters, and wilds. Raging Rex will act as the wild symbol in the game, standing in for all symbols to generate a winning combo, except for the burning meteor that will represent the scatter symbol on the reels. The Raging Rex wild symbol will appear stacked on the reels and if you are able to display a fully stacked wild symbol on any spin, you will activate the Rampage re-spins feature. During the Rampage re-spin feature, the Raging Rex wild symbol will start walking to the left, jumping from reel to reel with each re-spin. The Rampage re-spin feature will end once he reaches the first reel. As previously mentioned, the burning meteor will represent the scatter symbol on the reels and you will need to display a minimum of 3 meteor scatter symbols to activate the Raging Spins feature. Displaying 3, 4, 5 or 6 meteor scatter symbols will award 8, 15, 20, or 30 free spins, respectively. Should you be lucky enough to display 3 or more meteor scatter symbols during the Raging Spins feature, you will receive 5, 8, 15, or 20 extra free spins for displaying 2, 3, 4, or 5 meteor scatter symbols. In addition, you will get the opportunity to choose between Primal Rage and Wild Hunt prior to the start of the Raging Spins feature and will receive an instant win worth 5 times your total bet size before the free spins get underway. With the Primal Rage feature, the Raging Rex wild symbol will occupy a random reel with every free spin, while the Wild Hunt feature will offer additional Raging Rex wild symbol that also comes equipped with multiplier values. These multipliers have the potential to award up to 243 times your total bet when they are combined. The new Raging Rex slot from Play'n GO offers an exciting selection of dinosaur-themed symbols to further compliment the look and feel of the game. The high-valued symbols include a Parasaurolophus, a Triceratops, a Dilophosaurus, and a Velociraptor that provides the highest payout of 750 coins when six are displayed within a single spin. You will also find a wide variety of low-valued symbols that have all been fossilized in an array of colors, including lizards, dragonflies, scorpions, beetles, spiders, and mosquitoes to help form winning combinations. Players will also be pleased to know that the new Raging Rex slot offers a plethora of betting opportunities, catering to both beginner and slot veteran alike. Although it doesn't feature a traditional pay line structure, it does boast with 4,096 Ways to Win. Players will be able to start their expedition from $0.20 on a single spin or opt-in to bet the maximum of $100 on a single spin. There are 13 different bet values embedded in the slot which means there's loads of flexibility in terms of betting. 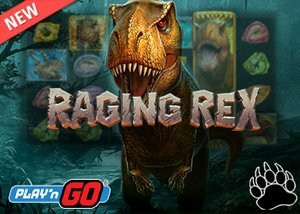 The new Raging Rex online slot was released in January 2019 and is available at all Play'n GO casinos with a remarkable 96.34% return to player ratio. This high variance slot offers incredible graphics, crystal clear sound effects, and plenty of winning opportunities around every corner. You can play the new Raging Rex slot at LeoVegas Casino where you'll be greeted with a 200% welcome bonus up to a maximum of $100 along with 25 free spins on your initial deposit.